I started doing lash lift treatments a little over a year ago where I was introduced to a master trainer, we became good friends and I helped her in training courses and really get her business off the ground. However, we parted ways and kind of went on our own separate ways. 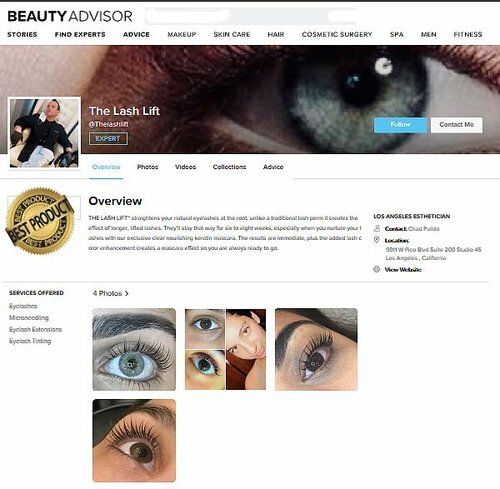 I started the lash lift company and offer my services in 2 salons in Orange County and the main location For the lash lift is on rodeo drive in Beverly Hills. The name of the salon is karma and the salon offers piercings, tattoos, permanent makeup, & of course the lash lift treatment and training course are offered as well. I love the edginess of the salon and services that we over on rodeo drive and feel like we stand out visually as well as by the exceptional work we offer. The treatment is definitely becoming more known and trendy in the Beverly Hills area and the results speak for themselves. The lash lift is the natural alternative to lash extensions . Great, so let’s dig a little deeper into the story – has it been an easy path overall and if not, what were the challenges you've had to overcome? When it comes to the beauty industry, I have learned to definitely keep friends close and “enemies” closer. Living in LA where competition is brutal and everyone is trying to make it to the top. Since the Lash Lift is a newer treatment, the potential for an amazing startup business is definitely there. With that being said, I’ve learned that people you come across in this industry are determined to succeed and at any cost. I’ve learned something valuable through all of my hurdles. Getting clients, marketing and finding a way to promote myself was what I thought would be tough, it is a process but hard work pays off & It’s getting better and better. Please tell us about The Lash Lift. The Lash Lift is the ultimate treatment! During the process, lashes are lifted right from the root helping to enhance and emphasize the eyes. Whilst creating the illusion of length and volume that lasts up to 10-12 weeks, clients that have straight lashes now have a permanent lift giving the same effect of eyelash curlers & extensions. This opens the eye making the lashes appear longer. Complete this treatment with an eyelash tint to really give your client the permanent mascara look, Even apply false lashes after the treatment for a more dramatic look. I’m the Lash Lifts master trainer and also apply the treatments to clients on a day to day basis. This treatment is extremely different from all the old methods of eyelash enhancements. through this technique your natural lashes are lifted up with a special pigment infusion, and results in thick, dark lashes that are beautifully curved upwards. this creates the universally desired “open-eyed” look. The boosting and lifting effect lasts for up to 3 months, which is the natural life cycle of the eyelash. the treatment also has the anti-ageing properties with the help of coenzymeq10. Eyelashes have a dramatic impact and enhance the eyes and help frame your face. there are no false lashes attached or any harmful adhesives used. this advanced treatment works by boosting and lifting each individual lash, then tinting them for a thicker, darker and longer looking lash. This new lash treatment will increase length, thickness, and uplift to your own eyelashes. The lash lift technology uses new innovations based on the improvement of the natural structure of each cilium. the lash lift is the antidote to straight stubborn lashes and eyelash extensions – the most up-to-date method of naturally curling your own lashes. this new procedure has transformed archaic, inadequate perming techniques’. the lash lift uses the very latest technique in beauty technology to enhance the natural eyelash and, the eye itself. Proud to be part of a beauty trend that’s been featured in cosmopolitan, allure & beauty blogs worldwide. My favorite memory from when I was a child would probably be when I realized I was unique & it was a good thing.